Vincent van Gogh is one of the most popular artists in the world. His vivid colors and moving paintings come alive in this couples room. 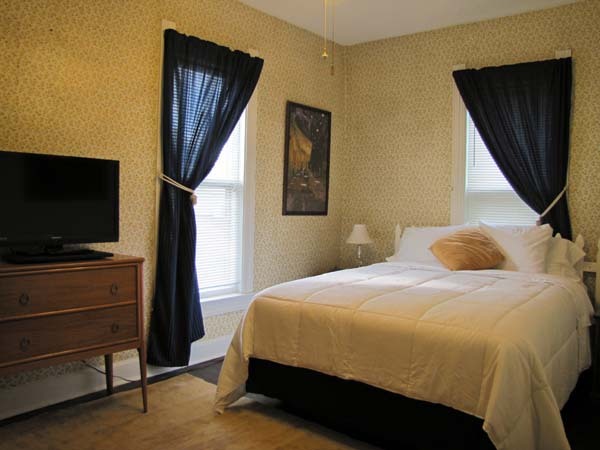 This quaint cozy room for 2 is the perfect couples getaway, it’s windows look out at the lovely Magnolias that surround the house. The 8’ ceilings and original maple floors accentuate the van Gogh Prints that line the room. This room features a queen bed, chair, and dresser. En-suite bath with a claw foot tub has plenty of space for your items. This room sleeps 2 people. Vintage and antique furniture, clock, ceiling fan, hot water dispenser and mini frig are provided. The room also has extra blankets, pillows, hairdryer, toiletries and plenty of room to relax. Enjoy your favorite show on a flat screen internet TV after your day of shopping or hiking.